Dry shade is always a tough spot to grow anything but weeds in for most gardeners. Here is a collection of shade-loving perennials that thrive in dry shade. The height and brief description of each is included. Try these out in those troublesome spots. Most will perform best in dappled shade or part shade. Needless to say, the ones that tend to be invasive do best in deep shade. Plants with pale or variegated leaves will show up best and really brighten dark corners. Bishop's weed 10-12 Variegated, green and white foliage. Very invasive. Contain between cemented areas and deadhead flowers before they go to seed. Kinnikinnick 4-6 Evergreen. Red, edible berries. Use beneath established evergreens or broadleaf evergreens in acid soils. Elephant's ears 8-12 Evergreen. Large, rounded, leathery leaves form dense clumps. From late winter, pink to white flowers emerge on compacted spikes that gradually lengthen to about 1ft. Carpathian harebell 6-14 Can be invasive, but tends to spread slowly. Blue or white flowers. 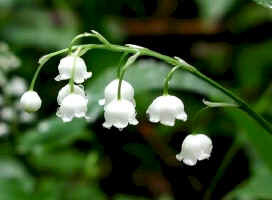 Lily-of-the-valley 6-10 Fragrant, white flowers in May-June. Inedible, red berries. Can be invasive. Barrenwort Superb dry shade epimedium. Pink and yellow flowers on short stems in early spring. Young leaves are marbled bronze and coppery red - turning green in summer, but colors up again in autumn. Sweet woodruff 6-8 Very invasive. One of the best covers under shrubs. White, fragrant flowers in May-June. Hardy geranium 12-18 Semi-evergreen. Aromatic rounded leaves. Pink flowers in spring. Red foliage in fall. Spotted dead nettle 6-10 Heart shaped leaves-silver mottling, white, pink or purple flowers - long bloomer. For poorish soils and partial shade. Can be invasive - shallow rooted plants are easy to move. Hall's Japanese honeysuckle 6-12 Will also grow in full sun, but forms denser mats in shade. This favorite vine is also great as a groundcover. Fragrant white flowers turn buttery yellow as they age. Semi-evergreen. Creeping Oregon grape 6-12 Evergreen. Yellow flowers in spring. Holly-like foliage. Inedible purplish berries. Spreads by underground stems. Creeping or mat penstemon 12-24 Very prostrate mat of tiny narrow leaves. Purplish flowers in May-June. Rocky Mountain penstemon 24 Blue flowers in June-July. Good cut flower too. Can be used for erosion control. Lungwort 12-16 Light-spotted dark green leaves attractive all season. White, pink or blue flowers in spring-some open pink and turn blue. Solomon's seal 30 Stems emerge above a dense root system, reaching 1.5ft before bending to form loose arches. Waxy white, green-tipped flowers. Foam flower 12-24 Woodland flower. Toothy crinkly leaves form dense mats. Foamy white flowers in spring. Stick to this unimproved version of tiarella. The others won't work in shade. Periwinkle 4-6 Semi-evergreen. White or purple flowers in spring.